This is a wonderful ancient Greek gold pendant ornament, dating to the 4th century B.C. It is rosette shaped, depicting a blooming flower of many petals. 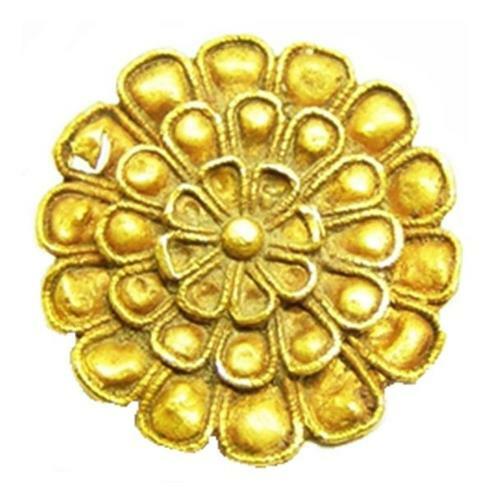 Rosette shape jewelry was very popular in Hellenistic Greece, gold jewelry becoming more prolific after the conquests of Alexander the Great into Persia and the East. This ornament retains a cylindrical tube on the back, enabling it to be worn in the hair, attached to a pin or as a pendant (threaded through the tube). It is a bold and very beautiful piece of early gold jewelry, in excellent excavated condition. One of the petals has a hole (see images). This will make a unique and very noticeable pendant, to wear again today on a chain. DATE: c. 4th century B.C.